Dubai loves to shop. The city has just about perfected the art of the mall. Dubai is considered as a shopper’s paradise. Dubai is one of the most popular shopping capitals of the world. The shopaholics from around the world visit Dubai for shopping, even they route their flight through Dubai for shopping only; there is something for everyone to buy in the UAE. Bargains abound but you do need to know where to look. The city of Dubai is the paradise for carpet lovers. 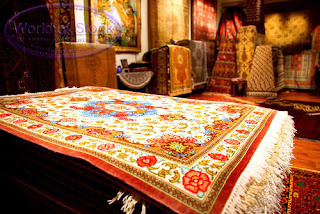 Most popular ones are fine Persian carpets, Kurdish kilims, colorful Turkish and rough-knotted Bedouin rugs. You will find very fine quality carpets at good prices. Well you have to do some bargaining. There are hundreds and thousands of choices to choose from. Quality of these rugs is mostly judged by the method used to process wool. You should know how the wool was treated to make a rug or carpet. If a rug is made with acid-treated wool, it will not look as rich after some years as it was when you bought it. On the other hand, rugs made by proper treatment of wool last for years and don’t lose their color and shine. 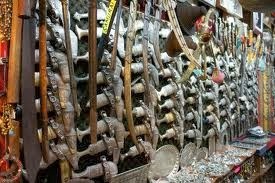 You should visit the famous GoldSouk to buy gold. Here you can find all types of gold jewelry in different shades like yellow, pink, green etc. 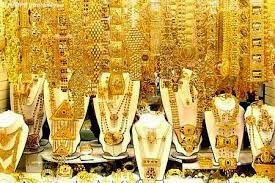 Dubai sells and imports huge amount of gold. Once you walk around Gold Souk, you will come to know that it indeed deserves this title. You will find row upon row of shops with dazzling displays of gold jewellery in every conceivable design and purity: Eighteen- and 22-carat are common, but 24-karat is also available, although the deep yellow hue of the high-carat jewellery is not to everyone’s taste. If you wish you can also purchase kilo bars, ten tola bars, small minted bars and gold bullion bars. The basic cost of the gold is set by weight daily – check the daily prices in the local newspapers. One can find beautiful khanjars here. Khanjars are the curved dagger of Islamic countries. Usually the handles of khanjars were made from the horns of rhino but these days handles made of wood are also very common. The general khanjars contains 2 rings in which the belt is attached and its scabbards are beautifully adorned with silver wire. The difficulty of these silver wired-thread patterns determines the cost of the khanjars. However, the Sayidi khanjars consists of 5 rings and are mostly covered n silver sheet with very less or no wire. The costs of these khanjars are determined by its weight and craftsmanship. Fakes are found all over the world, but in Dubai you’ll find bargains on real, silky-soft 100% pashmina shawls. Women around the world adore pashminas, those feather-light cashmere shawls worn by the Middle East’s best-dressed ladies. 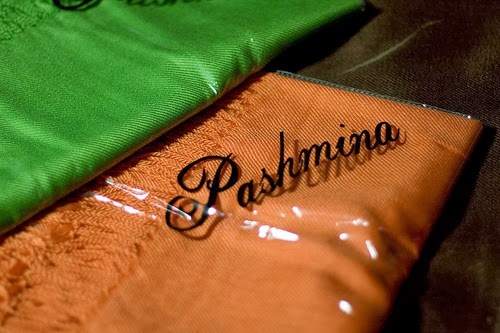 If you’re shopping for a girlfriend or your mother, you can never go wrong with a pashmina. They come in hundreds of colors and styles, some beaded and embroidered others with pompom edging – you’ll have no trouble finding one you like. But aside from setting it alight to make sure it doesn’t melt (as polyester does), how can you be sure it’s real? Here’s the trick. Hold the fabric at its corner. Loop your index finger around it and squeeze hard. Now pull the fabric through. If it’s polyester, it won’t budge. If it’s cashmere, it’ll pull through – though the friction may give you a mild case of rope burn. Try it at home with a thin piece of polyester before you hit the shops; then try it with cashmere. You’ll never be fooled again. Every conceivable perfume is available in the UAE. Large perfume stores sell all the Western brands at very good prices. Smaller shops in the souqs stock local perfumes, a fragrant mix of Arabian oil blended to suit your requirements, but beware they are strong! You can also purchase incense such as frankincense. Some foodstuffs are also popular here which you should buy. These include cardamom flavored condensed milk which tastes great in coffee. Natco rose syrup is also a specialty which is often poured over ice cream. You should also buy saffron as it is cheaper here in Dubai. Zataar is also used in soups and salads so buy this. Zataar is actually made of thyme, sesame, oregano and marjoram. Sumac is also a food item. It is actually a spice having lemon like taste. Buy this and add it in salads, kebabs and other Middle Eastern dishes. T2everywhere.com providing Dubai tour packages depending upon your own choice. There are several packages available for Dubai. We are becoming popular day by day just because we provide tourists lots of options to choose and design their own tours to Dubai. Thus, all depends upon your preference like where to go, your budget, when to go. We will provide you the complete Dubai tour packages from your arrival to departure including accommodation in the best hotels/resorts, city tour, food,sports activities and many more. It is our duty to help you to take right decisions and choose right packages to make your trip unforgettable.